UBC researcher Gyan Chhipi Shrestha says high-density communities can make better use of the Okanagan's limited water supply. 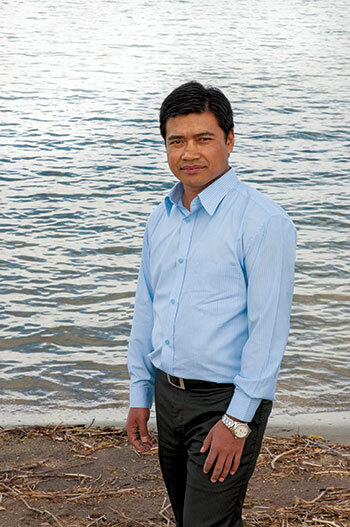 Gyan Kumar Chhipi Shrestha, a PhD candidate with the School of Engineering, has recently published several research papers about water use, water distribution systems, and the energy consumed supplying water to homes. Not only did he examine the cost of supplying water to homes, but also investigated the long-term, or life cycle costs, of water distribution systems to several communities. And the ecological footprint is staggering, he says, when the energy used to distribute water is considered. Chhipi Shrestha says there is a huge disconnect between the amount of water available in the Okanagan and the amount used. At its peak in the summer, the rate of consumption in the Okanagan is about a 1,000 litres per person per day—compared to the Canadian average of more than 340 litres a day. This overuse, he says, is primarily due to residential lawn irrigation. Working with UBC Okanagan’s Associate Dean of Engineering Rehan Sadiq, co-supervisor of the study, Chhipi Shrestha’s research specifically examines water distribution systems in various residential densities, how much these systems cost to operate, and how reductions can be implemented. Chhipi Shrestha completed an integrated study of the water-energy-carbon or ‘watergy’ dynamics of water distribution and residential landscaping under neighbourhood densification. He then proposed a conceptual framework to study the impacts of urban residential density on the water-energy-carbon nexus of water distribution and residential landscaping system. Along with supervisor Prof. Kasun Hewage, Chhipi Shrestha used a planned neighbourhood under development in Peachland as a case study and compared 11 neighbourhood design options of single and multi-family homes and various population densities. Hewage says the cost of water distribution systems can be lower in high-density residences, mostly because single family homes tend to have landscaped areas that require maintenance.